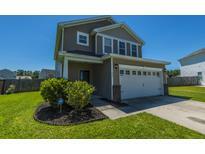 Find Goose Creek, SC Homes for sale. View Photos, Maps and MLS Data Now! Crowfield Plantation - Which features a gas fireplace (propane tank), a tray ceiling and a ceiling fan MLS#19011703. Carolina One Real Estate. Upstairs you will find a large open loft, large master and 2 additional bedrooms. MLS#19011657. Carolina One Real Estate. Straight ahead is the formal dining area with beautiful chandelier, and beyond that, the spacious family room that is filled with natural light coming in from the windows that provide a MLS#19011685. The Boulevard Company, Llc. You will find a hall bathroom MLS#19011715. Miler Properties, Inc..
Beverly Hills - The separate laundry room is located next to this space as well leading out to the awesome backyard. MLS#19011537. J Hancock Real Estate. Crowfield Plantation - There is also a 500 +/- SF of covered patio on the ground floor rear.... MLS#19011492. Carr Properties, Llc. Woodland Lakes - The master bedroom is truly a retreat with a large closet and a lovely bath MLS#19011202. Carolina One Real Estate. Crowfield Plantation - Upgraded POOL PUMP and pool CLEANER. ROOF replaced 2015. MLS#19011134. Carolina One Real Estate. Crowfield Plantation - Propane tank belongs to the seller. MLS#19011083. Carolina One Real Estate. Forest Lawn - This one is a must see! MLS#19011063. Re/Max Pro Realty. Brickhope Plantation - Neighborhood amenities: pool, community center, fitness center & playground. MLS#19010811. Keller Williams Realty Charleston. Master bath has separate tub and step-in shower and dual sinks. There are three additional bed- MLS#19010801. Coldwell Banker Residential Brokerage. Montague Plantation - Don't miss out on this incredible opportunity and schedule your showing today! MLS#19010699. Marketplace Housing. On The Main Floor, The Upper Floor Has 2 Guest Bedrooms And Guest Bath Adjacent To The Loft(Media Room). MLS#19010624. Carolina One Real Estate. Sophia Landing - Upstairs opens up into a huge loft and is surrounded by 4 bedrooms, including the master suite with a walk-in closet, and bathroom with dual sinks, enclosed shower and garden tub. MLS#19010470. Weichert Palmetto Coast. Medway Landing - King sized master offers a WIC MLS#19010586. Carolina One Real Estate. Woodland Lakes - Hardwood floors in the living room. Shows well! MLS#19010591. Carolina One Real Estate. The perfect place to entertain friends and family! A MUST SEE! MLS#19010588. Agentowned Preferred Group. Brickhope Plantation - The LOFT is the perfect flex space to be utilized as a media MLS#19010431. Brand Name Real Estate. The 4th bedroom is located downstairs and could be used as an office, playroom, or guest bedroom. MLS#19010456. Era Wilder Realty Inc.
Sophia Landing - Open with natural light. Both formals, mud room, loft. MLS#19010251. Eastwood Homes. St James Estates - But over all in great condition MLS#19010338. Palmetto Group Of Agentowned. The master features a good size walk-in closet and the master bath includes a garden tub and walk-in shower. MLS#19010152. Century 21 Properties Plus. Liberty Village - The other 3 bedrooms upstairs all include walk-in closets and will accommodate all family members or guests..Don't forget to ask about our industry leading standard features MLS#19010034. Lennar Carolinas, Llc. Liberty Hall Plantation - Come preview this home on a quiet cul de sac street today! MLS#19009731. Century 21 Properties Plus. These statistics are updated daily from the Charleston Trident Association of REALTORS® Multiple Listing Service. For further analysis or to obtain statistics not shown below please call Highgarden Real Estate at 843-968-0890 and speak with one of our real estate consultants.